Three Southern Virginia FRC teams competed at the World Championships held in Detroit, Michigan in April 2018. The three teams were the STAGS, the MADawgs, and the Cometbots. MARTINSVILLE — Two local robotics teams received some help on Wednesday in funding their trip to the world championship. A representative of Mid-Atlantic Broadband Communities Corp. on Wednesday ceremonially presented checks totaling $15,000 to the Piedmont Governor’s School STAGS, Martinsville High School MADawgs and Halifax County High School Cometbots robotics teams, which will be competing at the FRC (First Robotics Competition) world championship in Detroit later this month. 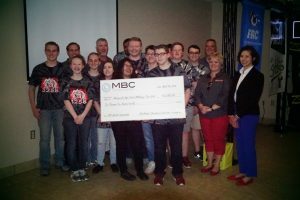 Lauren Mathena, director of economic development and community engagement for Mid-Atlantic Broadband (MBC), presented a check for $10,000 to the STAGS and checks for $2,500 each to the MADawgs and the Cometbots teams. She said MBC also is offering to match the fundraising efforts for the MADawgs and the Cometbots teams dollar for dollar up to $2,500 for each team. “I hope all of you guys do awesome,” Mathena told members of the three teams during the ceremony Wednesday at a lab for New College Institute at 31 Fayette Street. Robotics activities encourage students in STEM (science, technology, engineering and math) fields and that will help the economy grow, Mathena said. Depending on where they are geographically located, teams that qualified for the world championship competition will compete either in Detroit (April 25-28) or Houston (April 18-21). The team qualified with a top-10 finish after FIRST Chesapeake district play and have been named the 2018 MBC Challenge Cup champion. The MBC Challenge Cup is a competition that rewards superior performance for FIRST FRC robotics teams in Southern Virginia. The STAGS finished the highest of the 11 MBC-sponsored FRC robotics teams. In addition to $10,000, the STAGS gain possession of the MBC Challenge Cup trophy for one year. The Piedmont Governor’s School STAGS are in their 15th season and are based in Martinsville. This season, the STAGS team has 18 student members from Magna Vista, Bassett and Martinsville high schools, and nine adult mentors. Brian Pace — director of Piedmont Governor’s School for Science, Mathematics, and Technology – is the lead mentor of the STAGS. So far this season, STAGS achievements have included: district finalist (second place) and the Industrial Design Award at the Central Virginia district event; a district winner (first place) and received the Team Spirit Award at the Southwest Virginia district event; and the Imagery Award at the FIRST Chesapeake District Championship event that was held at the University of Maryland. After the check-presentation ceremony Wednesday, several members of STAGS were asked how they feel about the team’s qualifying for the world championship. Xavon Stanley said. “I think it shows that we are making progressive moves in encouraging the STEM fields in the Martinsville-Henry County,” said Xavon Stanley. His teammate Samantha Edwards agreed. Alayna Williams said she was really excited and really proud of the team. “I thought we were going to have to pay a lot of money ourselves or do a lot fund-raising,” Alayna said. Now the STAGS can focus on strategies and working on robotics, she added. “I’ve always stressed that everybody has a job and everybody has to do their job,” he said. Success in the first tournament gave team members a lot of confidence, Pace said. Pace said in addition to the $10,000 from MBC, the STAGS raised about $7,000 through fund-raisers, and Microsoft is providing $5,000 for each of the three teams. Cassell added that the program has nearly doubled since last year, in terms of membership and the number of students. Students participating in the FRC program are challenged in multiple fields, such as electronics, programming, pneumatics, business/marketing. Each year, a new game is presented to the teams, giving these students the opportunity to create new solutions by becoming better thinkers and problem solvers. Teams have six weeks to design, build, code, and test a robot that executes the task that was presented to them for competition. 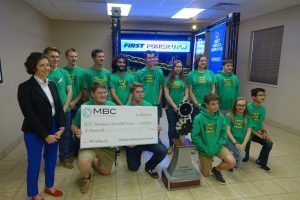 MBC has invested more than $350,000 in support of FIRST FRC robotics programs since 2012 to help meet the work-force demands of current and future companies in the Southern Virginia region. If your high school is interested in forming an FRC robotics team, contact Lauren Mathena at lauren.mathena@mbc-va.com or (434) 570-1321. Paul Collins reports for the Martinsville Bulletin and can be reached at paul.collins@martinsvillebulletin.com. The Halifax County Middle School robotics program received a major boost yesterday as the Mid-Atlantic Broadband Communities Corporation presented a $5,500 check to the Halifax County Public Schools Education Foundation to go towards the popular student activity. The gift will be used to replace Lego Robotics equipment that is currently outdated and for which replacement parts are no longer available. Regan Priest, robotics instructor at the middle school, said the money will allow him to purchase new Lego Mindstorms Evolution 3 kits, directly benefiting an average of 100 eighth graders each year. Also helped: some 100 seventh graders who will receive robotics equipment currently in use, to be handed down from the eighth grade as the new kits become available. Tad Deriso, president and CEO of Mid-Atlantic Broadband, and MBC vice president Greg Lytz were on hand yesterday for a check presentation to Foundation president Coleman Speece and treasurer Tay Bost, school superintendent Dr. Merle Herndon and HCMS principal Faye Bruce. Deriso said his company strongly supports robotics programs in area schools. Just this week, said Deriso, he talked with a representative of a British firm who pointed to the importance of robotics programs in middle and high schools. The interest that robotics creates among students is very important to employers, the British representative told Deriso. Sixth grade students at the middle school demonstrated that interest as robotics team members staged a brief competition as part of yesterday’s check presentation. There was even a challenge match between Deriso and Lytz. Lytz emerged the winner, receiving a big cheer from the youngsters on hand. With big smiles on their faces, the students also cheered their instructor, Priest. Several of the middler schoolers announced that robotics class was definitely their favorite. Herndon and Bruce expressed their appreciation for the donation, noting that with tight budgets, the MBC gift will make it possible for the school division to purchase equipment that otherwise it could not afford to provide to students. The high school robotics program, carried out at the STEM Center, was discontinued several years ago due to tight budget conditions.